Astrophysicists at the University of Toronto have discovered a new, huge exoplanet, 13 times bigger than Jupiter. It's in orbit round the massive star Kappa Andromedae, which is part of the constellation Andromeda. Kappa Andromedae is 2.5 times the size of our own sun, and at 170 light years away can be seen with the naked eye. 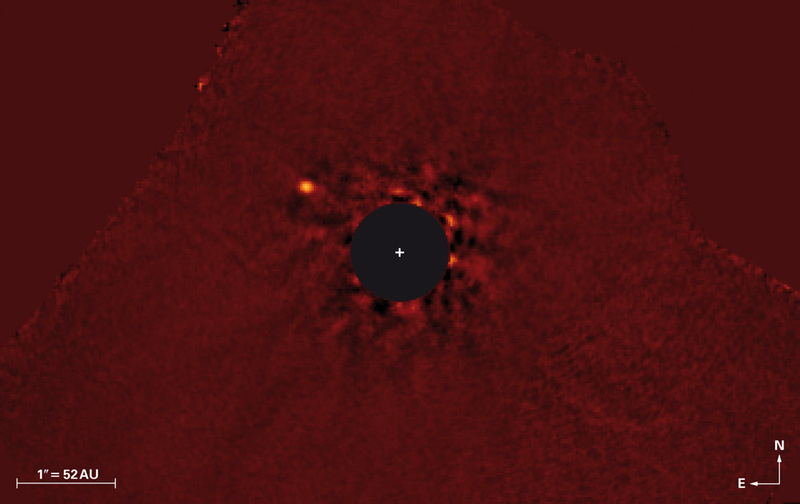 The researchers used infrared images from the Subaru telescope in Hawaii to gather the faint images of the new planet. 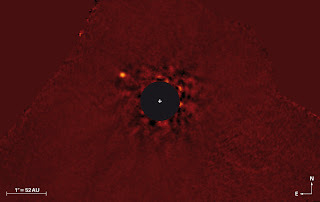 "This planetary system is very different from our own," said Thayne Currie, a post-doctoral fellow in the Department of Astronomy & Astrophysics at the University of Toronto and co-author of the paper. "The star is much more massive than our sun, and Kappa And b is at least 10 times more massive than any planet in the solar system. And, Kappa And b is located further from the star than any of the solar system planets are from the sun. Because it is generally much harder to form massive planets at large distances from the parent star, Kappa And b could really be a challenge for our theories about how planets form." Direct imaging of planets outside our solar system is exceptionally rare, because the brightness of the host star nearly always obscures the planet from view. The team used a technique known as angular differential imaging to remove the overwhelming glare of Kappa Andromedae. The resulting infrared image shows a tiny point of light that is Kappa And b. "Although astronomers have found over 750 planets around other stars, we actually directly detect light from the atmosphere of only a few of them," explains Currie. The discovery was a collaboration between astrophysicists at the University of Toronto and other institutions across the United States, Europe and Asia, as part of the Strategic Explorations of Exoplanets and Disks with Subaru (SEEDS) program. The report on the super-Jupiter is published in the Astrophysical Journal Letters.